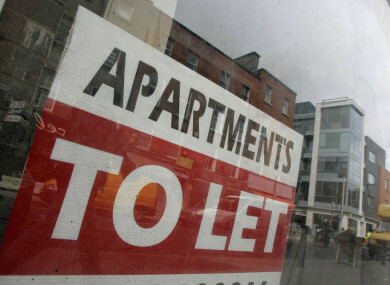 THE STANDARDISED NATIONAL average rent is now almost €1,100 per month. In April to June 2018 (Q2), the standardised national average rent was €1,094 per month, according to the Residential Tenancies Board (RTB). That’s up from €1,017 one year earlier. Nationally, rents grew at 7.6% annually in Q2 2018, particularly in and around urban centres, which represents an increase from 6.9% in Q1 2018. The rental price inflation increased in Q2 2018 to 3.4%, up from 2.7% in Q2 2017. This follows a period of more moderate growth on a quarterly basis. The figures are included in the RTB’s Quarter 2 2018 Rent Index report which was published today. The report is produced in conjunction with the Economic and Social Research Institute (ESRI) and is based on 18,716 new tenancies registered with the RTB in the same quarter. The report contains new data, for the first time, on rental trends in existing and new tenancies along with analysis on trends in the composition of the market. Existing tenancies shows year-on-year growth of 4.9%, compared with 8.4% in new tenancies. Tenancies in the Greater Dublin Area account for over half of all tenancy agreements in the country. In terms of the number of occupants, one or two occupants were in the majority of properties. Since Q4 2017, a slight decline in the shares of properties occupied by three or more people can be observed. Commenting on the figures, Rosalind Carroll, director of the RTB, said affordability “remains a significant issue in the rental market with continued economic and population growth contributing to rising demand”. Carroll said the fact that the rate of rental inflation year-on-year for existing tenancies was 4.9% just over half of the rate for new tenancies (8.4%) “shows that rent inflation in existing tenancies is more in line with what we would expect to see in Rent Pressure Zones”. New lettings show a larger increase year-on-year, exemptions from RPZs will explain some of this. However, it is also clear that this market must continue to be monitored and it underscores the importance of the proposed legislation in this area. Carroll said the new data will be important in assisting the RTB to “prepare for the new enforcement powers which it is hoped will be introduced before the end of the year”. “This will allow the RTB to investigate and apply sanctions where there are contraventions to the rent restrictions in Rent Pressure Zones,” she said. Responding to the index, Housing Minister Eoghan Murphy said quarterly trends “can be volatile, but they do continue to rise and this continues to be a challenge”. People are paying too much in rent and this has to be better controlled. Murphy said he will soon introduce new rent protection measures in the Dáil. Murphy said, however, that some positive trends are developing and “shouldn’t be ignored”. Email “The national average rent is now almost €1,100 per month ”. Feedback on “The national average rent is now almost €1,100 per month ”.